An addictive and shocking psychological thriller, full of twists you won't see coming, perfect for fans of FRIEND REQUEST by Laura Marshall. A friend who won't let you escape. When Karin is taken on a romantic break by her loving partner Aaron, she can't wait for him to propose. But her surprise weekend quickly becomes a nightmare from which she may never escape. Who wants everything you have. They are staying by the beach at the Midland - a grand hotel where Karin used to work. And where Karin's dangerous and obsessive ex, whom she has been trying to leave behind for years, is waiting patiently for her to return. Who won't stop until your life is in ruins. June Taylor was a TV promotions writer and producer for many years before turning to writing plays and fiction. She was runner-up in the 2011 Times/Chicken House Children's Fiction competition with Young Adult novel Lovely me, Lovely You. 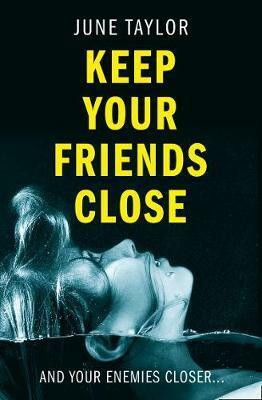 Keep Your Friends Close is her second psychological thriller. June is active in the Yorkshire writing scene, including serving on the board of Script Yorkshire and taking part in Leeds Big bookend.